Not long ago, I photographed Finnegan for a congratulatory ad after his recent sale to a new owner. After I arrived at the farm one late winter morning, his trainer pulled him out of the stall for a quick shoot. His whiskers and ears were freshly trimmed, and he’d been thoroughly groomed that morning in preparation. He looked beautiful. Finnegan was a good model with the exception of one issue: he really wanted to face the “wrong” direction based on the position of the sun. There were other horses turned out in paddocks behind him, and he kept trying to watch them play. He constantly pivoted around or had his ears back, tuning into them instead of us. I managed a few usable photos, but nothing exceptional. After changing a few settings on my camera for the backlighting and background, I had his trainer set him up in the opposite direction so he could watch his friends. While the lighting wasn’t ideal, these were by far his best poses, where Finnegan showed off his beauty, personality and intensity. I’ve found that often when photographing animals the best laid plans don’t work as well as you hope, and you just have to be an astute observer. They’ll “tell” you what they want, and if you listen, that’s when you’ll capture that coveted image. Finnegin is absolutely fabulous ! What breed is he? I’d imagine he sold for a pretty penny. 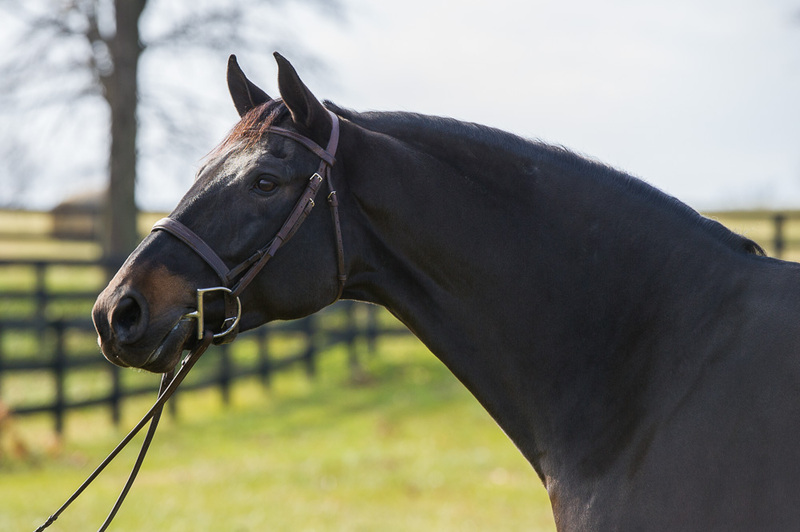 He’s a 6-year-old Hanoverian by Avec Coeur. He’s a cool horse who showed in the Young Jumpers last year but will transition to the hunters. Oh My..he went for big bucks then. Stunning horse. When he retires, send him my way won’t you? Yes, I would love to photograph him again on a nice day in the spring! I’ve often wondered how horses feel about being sold. Of course they probably don’t have any horsey concepts for the monetary end of things but they certainly experience the change in their life. I think some become more attached to their humans than others do, and maybe for them being sold is a bigger transition. Certainly being sold affects them all to a degree, though.